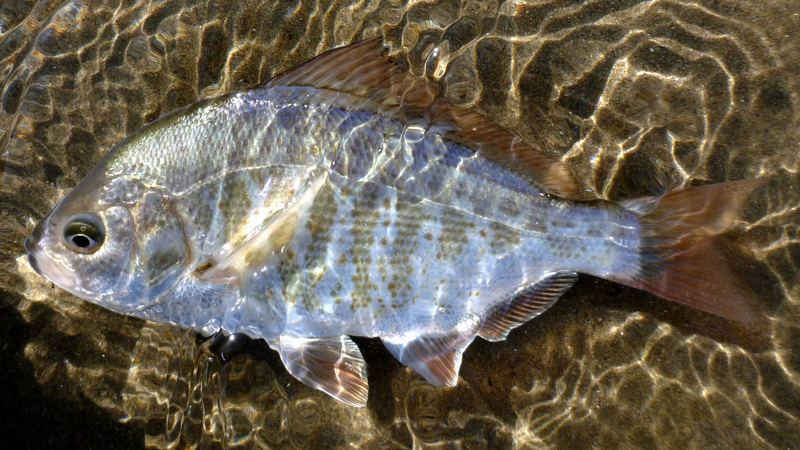 There aren’t a lot of ways to collect first hand information about surfperch in the surf zone. Boats can’t operate in the surf, scuba is out and handling a beach seine is next to impossible. Thus, we rely on hook and line angling. If we are going to invest much effort in that, we want to know when the fish are around. If you hang out on the beaches you already know it’s a pretty good bet that finding fish is all about the tides. I have already shown in And the King of the Surf is…, that among TOS surf-dwellers, redtail surfperch, Amphistichus rhodoterus, are the most abundant, so that’s a good place to start evaluating the relationship between abundance and the tides. 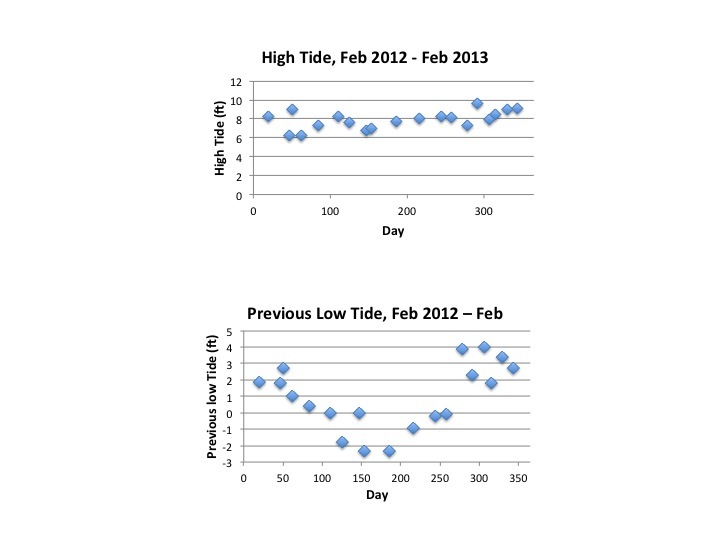 Below I plotted high tide and the preceding low tide on days I fished from February 2012 to February 2013. You can see in the top panel that high tide doesn’t vary too much. Therefore, it can’t explain much of the variance in redtail abundance. The other tidal measure I’ve always got on my mind is swing. Swing is the difference between high and low tide. I think about swing because the bigger the swing, the harder the fish have to work to stay in place. Alternatively, bigger swings really stir things up and may expose more prey. I don’t have a reasonable basis for preferring one of these alternatives over the other but I think swing might matter. In the lower panel above, notice that previous low tide varies systematically throughout the year. The lowest morning tides occur in a 5 month period from about day 100 to day 250. That’s when the biggest swings occur. Maybe swing explains variation in redtail abundance. 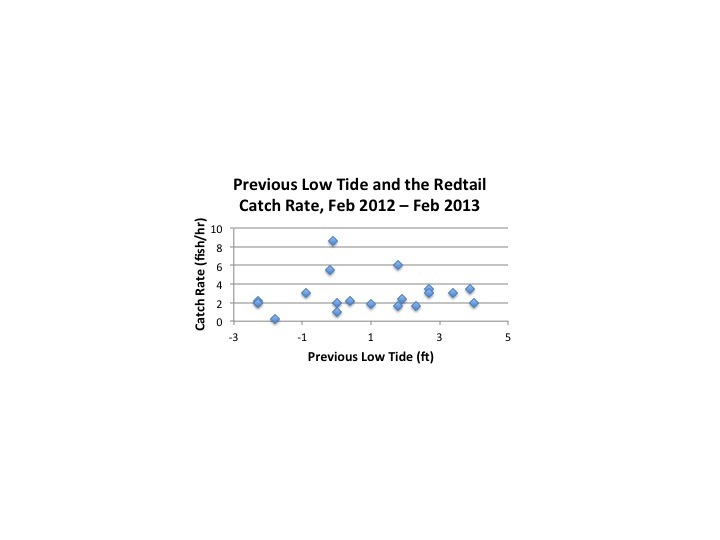 This graph shows that there is no relationship between previous low tide and catch rate. 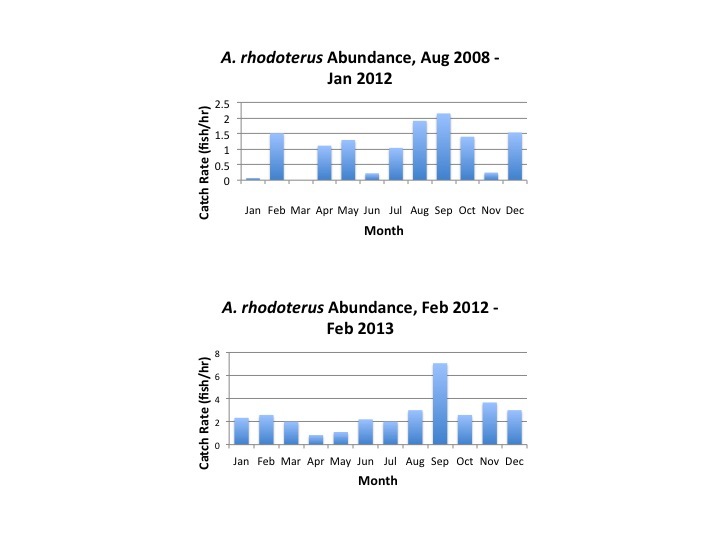 With hook and line angling I can’t make direct observations of abundance so I use catch rate as a surrogate for abundance. Some of the highest and lowest catch rates occur in the middle zone of the graph where swing is moderate. So, despite my intuition about swing, it isn’t a good predictor of redtail abundance. If I had to pick a day to reliably encounter lots of redtails in the surf I wouldn’t count on forecasts of tide height or swing to help me. So far, the best predictor of abundance I’ve discovered is time of year. Over years of sampling the surf I feel confident that August and September are months of great redtail abundance. I have also developed a pretty strong feeling that redtails can be pretty scarce in April, May and June, but I’ve never quantified any of this. To fix that I looked over my field notes since 2008 to see if I could confirm my impressions and make some sense of abundance through the year. The results of my sampling from summer 2008 to early 2012 are shown in the top panel. My sampling methodology during this period was all over the map and the highly variable results probably reflect that. Nevertheless, August and September look like months of higher redtail abundance. I refined my sampling method for a lure color choice study in February 2012 and the bottom panel shows the results for a single year using the new protocol. One of the first things I noticed is that catch rate under the new protocol is higher than in my previous work. This could mean I became a more effective redtail catcher or that 2012 was a year of comparatively high redtail abundance. The other thing to notice is high abundance in September and low abundance in April and May. I think the lower panel is a pretty good representation of redtail abundance throughout the year. One question you might have is whether or not catch rate is a good surrogate for abundance. Lots of people have asked that question and if someone wants to try diving in the surf to make direct observations of abundance that’s great. Until then, I’m assuming that redtails are aggressive biters in the surf zone and that catch rate is a great surrogate for abundance. Thanks! I just took a break from smoking salmon to check out your site. What a coincidence, the first post I saw on your site was smoked salmon, from back in Sept., 2012. Can’t wait to try your recipe. By the way, your site is fantastic. I love that arctic tern post.